If you are currently using large volumes of water and as a result, face charges from your main supplier; borehole water supply may be a solution you need to consider. You may also want to consider implementing a borehole water system if you have poor quality water or an unreliable water source. Water boreholes deliver clean water to your property and are even sustainable in drought conditions. Water boreholes allow you to source natural water without the contamination of chemicals. Also, worth noting is that if extracting up to 20,000 litres per day, a license is not a requirement. At Teckna Group, we offer complete packages for hydrogeological surveys, water borehole drilling, storage tanks, water borehole pump installations and water borehole filtration equipment. If you are interested in a residential or commercial water borehole, we would recommend that you first obtain a water borehole prognosis. A prognosis is required to determine at what depth water is expected to be reached as well as identifying the drilling conditions. 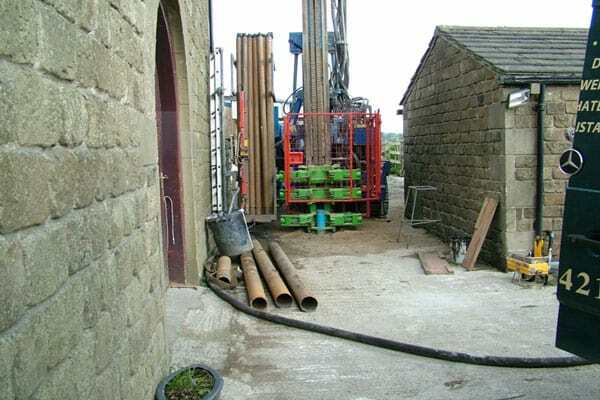 As with all our water borehole drilling services we offer national coverage to various depths and project sizes. Teckna Group works to all UK guidelines for water borehole installation to ensure the safe water abstraction. Groundwater is an integral part of the water cycle. Water travels through the ground due to gravity, passing through the varying layers of gravel, soil and rock, until it reaches the depth that is filled with water. You may have heard of the term ‘water table’. The top of the saturation zone is considered to be the water table, whether it be close to the earth’s surface, or hundreds of metres below. Under natural circumstances water can be brought to the earth’s surface via springs and can also be discharged into streams and rivers. We use boreholes to extract this water. Boreholes require sophisticated technology, expert knowledge and intricate design to function properly. The importance of a quality designed borehole is often overlooked, and many borehole failures come down to its construction. On completion of the water borehole a suitable sized high-quality water borehole pump will be installed. Options offered by Teckna Group include Grundfos, Lowara, ZDS or Caprari with flexible PE, Sure-Loc or steel riser mains. The finished water borehole head works can be installed at ground level in a sealed chamber or be above ground sited on a concrete plinth with a protective GRP chamber or similar product. All water boreholes should be suitably tested for the amount of water and draw down available. This is usually a minimum of three hours for domestic projects and can run into days for commercial projects, with the drawdown, step and recovery tests as a minimum. On completion of the water well drilling, which can take anything from a couple of days to 10 days, we will have the water tested at one of the UKAS Laboratories around the country. UKAS is the only government associated body authorised to assess to a recognised international standard. This ensures that any water sample tested from a water borehole is done to the same standards, on calibrated equipment, to give the same impartial testing result anywhere in the country.